Hi! This post will show you how to submit form using ajax in codeigniter. Generally when you submit html forms - page will be refreshed. But jQuery's ajax() method makes it possible to submit form, post and receive data without refreshing the page. Yep! A cool feature and so many modern websites use this technique to send & receive asynchronous HTTP request. And here we'll see how to use ajax in code igniter for form submission. Let's create a demo to submit form using ajax in codeigniter. As for this demo, consider you have a user subscription form with an input box for 'email id' and a 'subscribe' button - this is the form which you want to submit using ajax. First we'll need to create a controller for the demo and this would be it. Next we have to create view for the controller and add a form & other necessary elements. Then you should include jquery library and add js snippet which will collect the form data (in our case it's just email id) and submit the form via jquery's ajax() method. jQuery's ajax() function contains several options and we have used some of them in our example. Here are the descriptions for what those options stands for. method - specifies if the request is GET or POST. data - contains the form data as json format. It can either be a string or object. success - this function will be executed when the http request succeeds. error - and this function will be invoked if the http request fails. 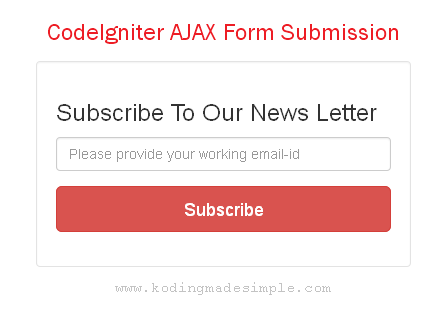 Submitting codeigniter form using ajax would be similar to submitting it with normal submit button. The only difference would be, that you have to load jquery library in codeigniter view and use it's ajax() or post() method to submit the form without refreshing the page. Like any other form, it will be submitted to the controller function and you have to specify it with URL option. So that explains how to submit form using ajax in codeigniter. I hope you find post this useful. Stay tuned for more interesting coding tutorials & tips. We provide our customers with the most up to date listing of coupons and the best deals for 2000+ Indian e-commerce sites. Now, we are out to sweeten the deal by offering Cashback to our users on top of the Discounts!